TRILO offers contracter the best vacuum sweeper for the job. With the S-line, you will always get exactly the machine you need, because you configure it yourself. By using our product configurator you can completely configure the machine that best suits your needs and wishes. No matter if you wish to sweep litter, leaves, debris or grass or cut fine or rough grass, the S-line offers the perfect solution for you. 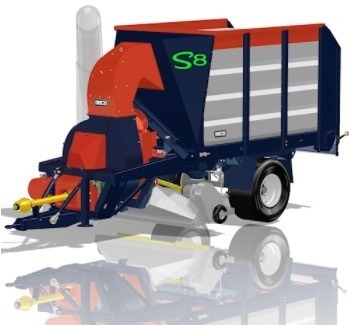 All of the new S-line sweepers are equipped with a powerful, 6 blade fan in a TRILO centrifugal pump. The air capacity has been increased by maximising the filter surface, by enlarging the air intake and by redesigning the brush hood. The position of the spout has been altered, increasing the filling degree of the container. The S-line is available in loading capacities up to 8 to 12 m3. Key point of the new design is a compact and short container, which allows for easy manoeuvring. 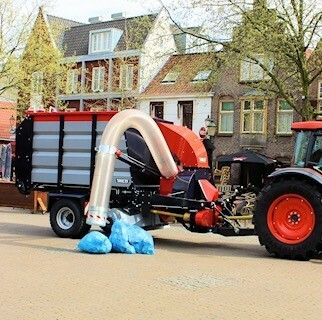 The new design also gives the improved brush hood and suction hose more room. The brush hood has been improved in life span, capacity, multi functionality and ease of maintenance. 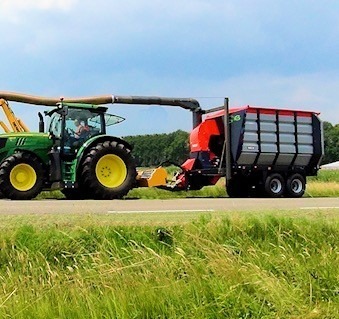 The boom with suction hose has been enlarged by 50% to 2.5 meter, which allows the driver to collect materials from even further away from the sweeper. The suction hose is placed closer to the sweeper which improves the sight to the rear. The boom can be placed on both sides of the machine. All S-line models are driven by XPB belts with automatic tighteners. The grease points have been replaced with maintenance free bearings, for example in the boom, the front rollers of the scraper floor and the hinges of the back door. The remaining grease points are easily accessible. All functions are cabine controlled with a compact joystick. Required hydraulics: 180 bar – 40 l/min.